Hello my lovelies! I'm so excited for today's post! I've been trying to master this technique for a while now and this is the first time I can actually show you the result. It's by no means perfect and there is no real pattern, so every nail is different, but I'm still happy with this mani. Here it is! 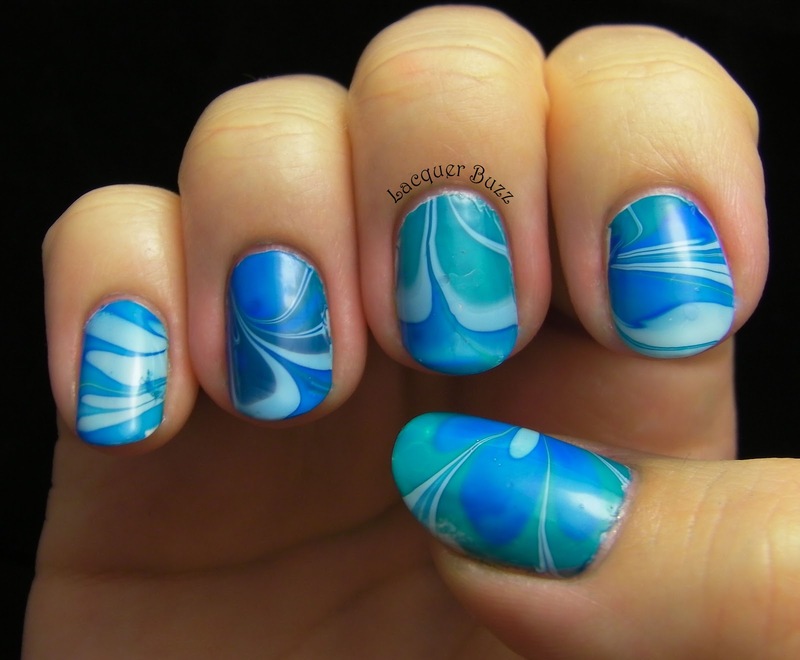 For this water marble I used only Flormar polishes: two blues (423 and 438) and a green (437). Of course I used a white base underneath to make this opaque. I chose these polishes because I didn't want to waste any of my more expensive and hard to find polishes for this. But I'm happy to say that these spread nicely in the water and are pretty opaque. 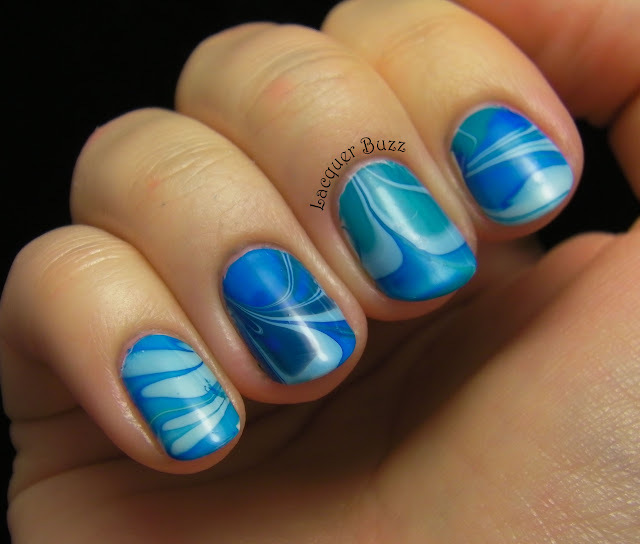 The first time I tried to marble with these colors was last weekend. But I kept getting these bubbles in the polish that wouldn't go away. I was so frustrated that I gave up. I then asked the lovelies on Instagram if they knew what that was. Turns out I was pulling my finger too fast out of the water. I also watched some videos from My Simple Little Pleasures on Youtube and found out that you have to pull your finger at a straight angle from the water. 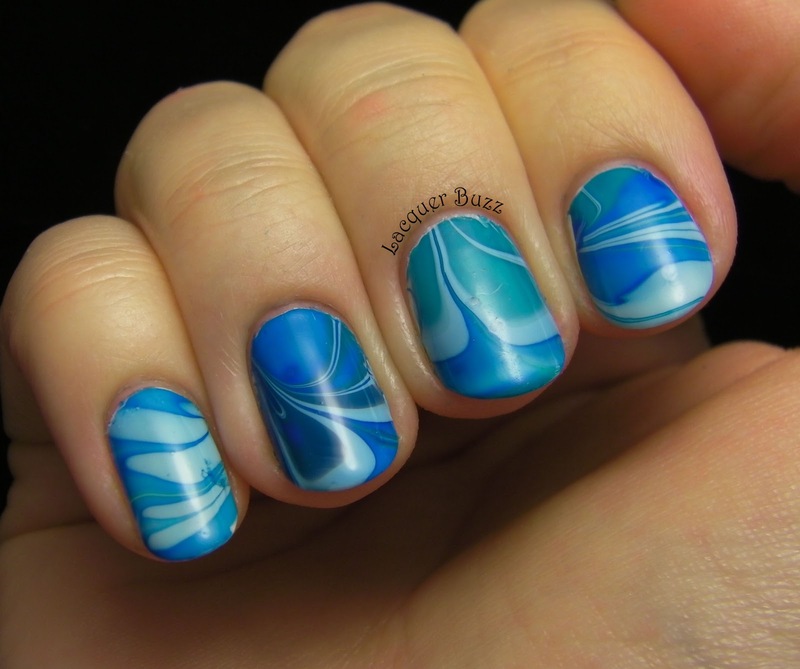 Seriously, head out to her channel and watch her videos because this lady is the queen of water marbling! I followed her tutorials and everything went great. No more weird bubbles in my polish! So now that I've nailed the basic technique, I need to learn how to create some patterns so that my nails look more similar and not that random. You can see that none of my nails has the same design as the other ones. Here's a photo of my left hand. This one looks even more different than my right one. I'm so happy that I finally got this right. This is the ultimate proof that you should never give up when trying something. Even if it's difficult in the beginning and you keep failing, you should try again. You will see that it will get easier eventually and once you get it right you will feel great satisfaction. Am incercat si eu manichiura asta,dar nu mi-a iesit. Insa vreau sa mai incerc. Ti-a iesit foarte dragut. O sa urmaresc si eu acele tutoriale propuse de tine. Si imi place mult ce ai spus tu mai sus; sa nu renunti niciodata chiar daca la inceput nu e asa usor. E un sfat bun pt orice situatie din viata :D .
Awesome job Mihaela!! 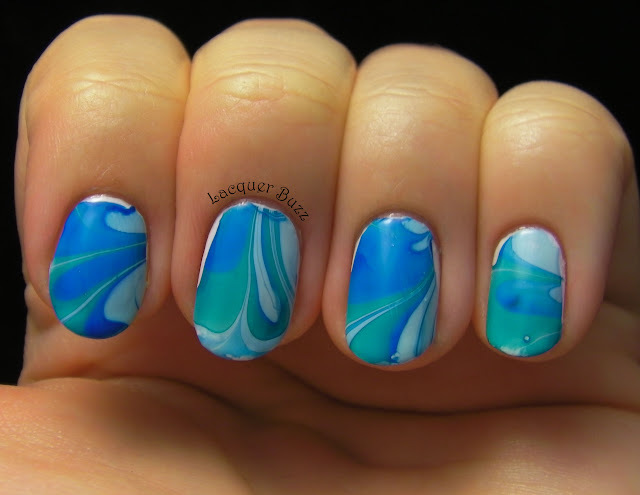 I love watermarbling. I really need to do one soon. I've just been lazy, smh. That's beautiful, great colors, I don't think the patterns need to be alike at all. Thanks for the tutorial link, I've bookmarked it for future reference. Ce frumos ti-a reusit! Super! Yay Mihaela!!!!!! This looks fantastic!!!!!! I don't think they should look similar at all!!! Thank you! I say you should keep trying and try investigating what went wrong each time and how to fix it. Multumesc! Neaparat sa nu renunti. Si eu am renuntat de multe ori dar dupa aia am luat-o de la capat. Multumesc mult! Asa este. Se poate raporta la orice. Daca te uiti la tutoriale o sa vezi ca pare din ce in ce mai usor. Si modelele ei sunt dementiale! Thank you so much! 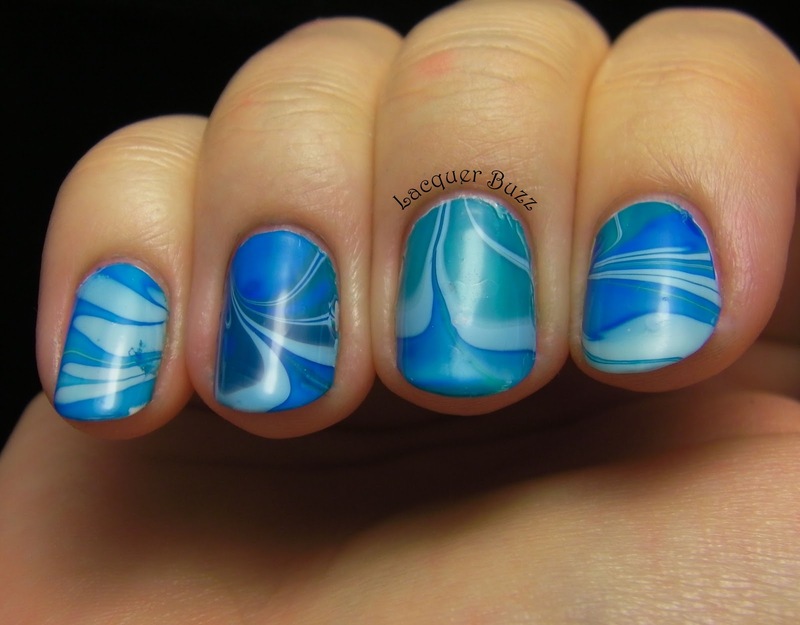 These are my favorite colors and since I'm a blue lover my first water marble had to be blue. Thank you Gosia! I'm not gonna lie, I had polish all over my fingers and it was a mess. The cleanup was a nightmare too. But I was so proud of the result. One day you will try it too, I'm sure. Thank you so much! Yeah she's great and she really deserves to be more popular on Youtube. Thank you Marisa! Yeah, it takes a lot of guts to start one because you end up working for 2 hours on it. Or at least I did. But in the end it's fun. Thank you so much! That's such a great compliment! Thank you so much! I chose some of my favorite colors which also came from a cheaper brand. It's good to experiment with less expensive polishes first.